The Medi Mediven Elegance Class 1 Black Thigh Compression Stockings with Top Band are compression stockings from Medi, one of the UK's leading compression stockings manufacturers. It also features a double heel reinforcement, which makes the Medi Mediven Elegance Class 1 Black Thigh Compression Stockings with Top Band even more comfortable. The Medi Mediven Elegance Class 1 Black Thigh Compression Stockings with Top Band features Clima Comfort, which reduces sweaty feet and stops skin from drying out. Clima Fresh keeps the stockings fresh and hygienic by preventing fungus & bacteria from sticking around. 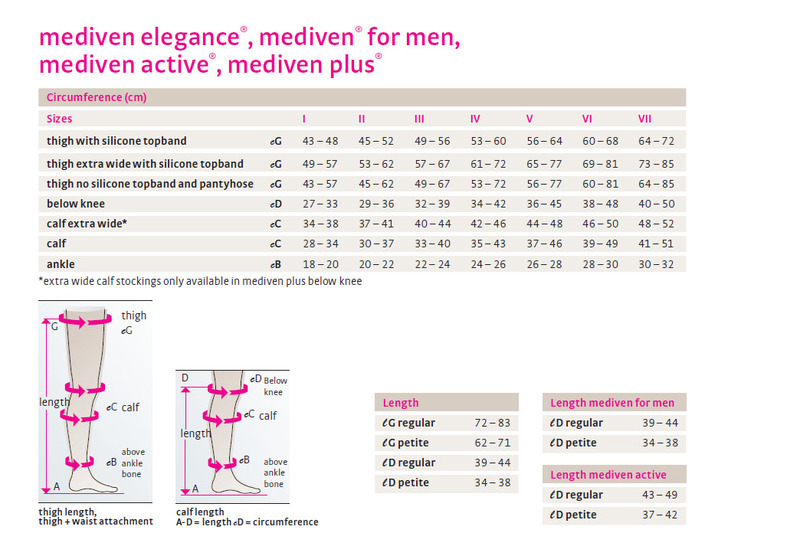 Medi Mediven Elegance Class 1 Black Thigh Compression Stockings with Top Band are non-returnable and non-refundable on grounds of hygiene. Very comfortable to wear all day long. Delivery was fast.